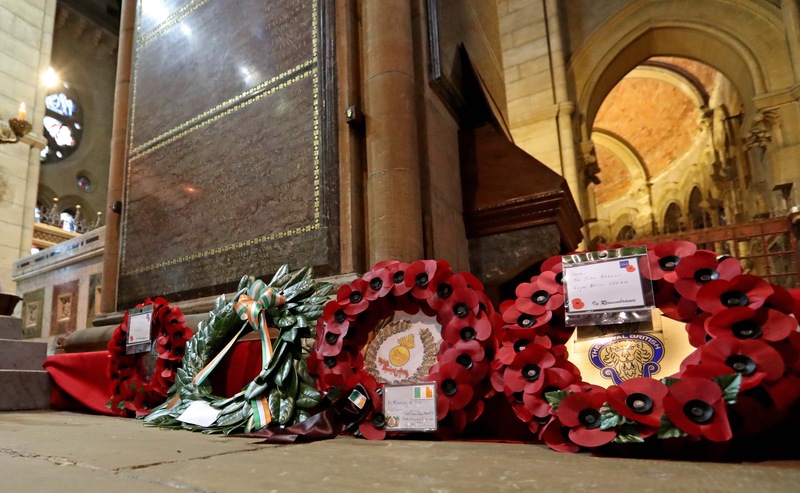 Saint Fin Barre’s Cathedral, Cork was full on Sunday afternoon, 11th November, for a Service to commemorate the centenary of the end of the First World War. The citizens of Cork were led by the Deputy Lord Mayor of Cork, Cllr Thomas Moloney, and the Government was represented by Senator Jerry Buttimer. The Lord Mayor of Cork, Cllr Mick Finn attended the morning Service at the Cathedral, a Requiem with the reading of all of the names on the Cathedral’s war memorial, before travelling to Dublin for the inauguration of the President. Armistice Day. The Centenary of the End of World War I. 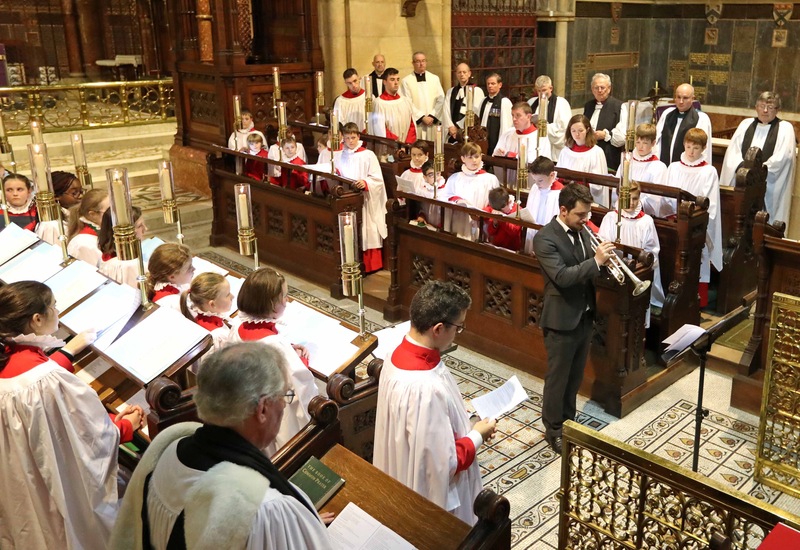 A Diocesan Service to mark the Centenary of Armistice Day, the end of World War I, at Saint Fin Barre’s Cathedral, Cork. The Right Reverend Dr. Paul Colton, Bishop of Cork, with telegrams of the names of Cork victims of World War 1. 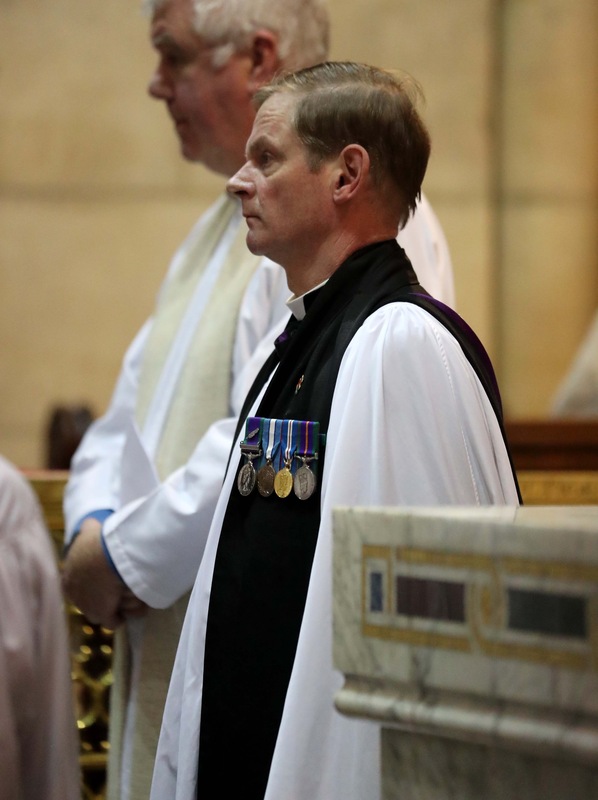 At the heart of the Service were the readings from the Bible, the specially chosen music, and symbols: one wooden cross (a First World War temporary grave marker) emblematic of all who died; the candle which was beside it, a sign of the hope of resurrection; the wreaths which were laid; and the nearly 4,200 facsimile First World War telegrams, each bearing the name of a Cork casualty of the war. These were written by the students of second level schools in the Diocese – Ashton School, Bandon Grammar School, and Midleton College. People from all over Cork City and County and further afield, of all ages, filled the Cathedral. Members of the Defence Forces present were led by Lt-Col Sean Dunne who laid the first wreath on behalf of the Defence Forces. Also present were Chief Superintendent Barry McPolin of An Garda Síochána and Judge Seán Ó Donabháin. From Cork City Council, in attendance were Cllr Tim Brosnan, and former Lords Mayor Cllr Michael O’Connell, Cllr Chris O’Leary, and Cllr Tony Fitzgerald. 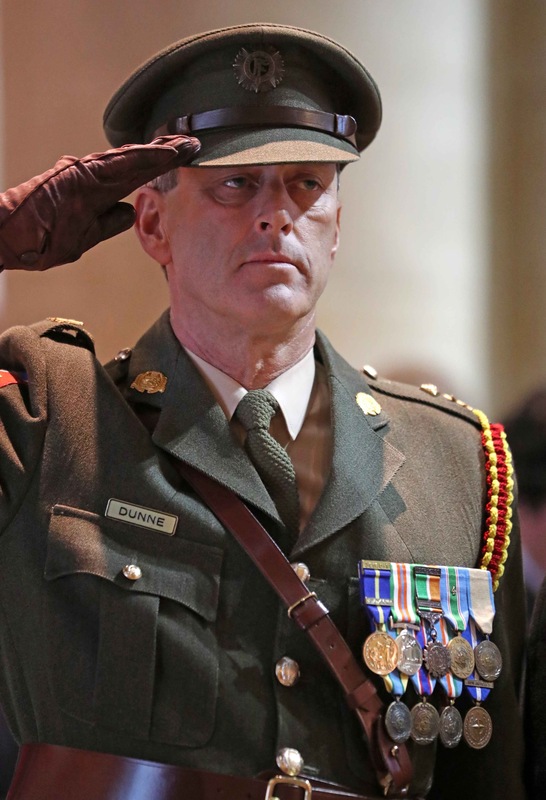 Lt. Col. Sean Dunne, Head Quarters 1 Brigade Collins Barracks, during the Wreath laying Ceremony. Among the many representatives from organisations in Cork City and Council were Mr Ted Owens of the City of Cork Education and Training Board, Mr Michael Mulcahy of Cork Civic Trus, and representatives of the Western Front Association, the Munster Fusiliers Association, the Leinster Regiment Association, and the Royal British Legion. Among those representing other countries were the Consuls of Belgium (Mr Dominic Daly), Denmark (Sir Freddie Pedersen), Finland (Mr Conor Doyle), Portugal (Mr George Barter), and Spain (Ms Cathy Goode). 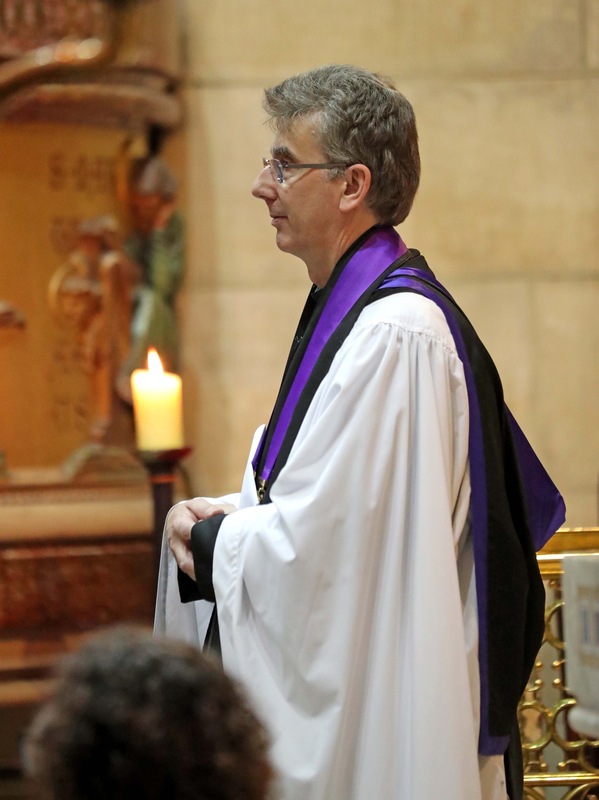 Clergy and Readers of Cork, Cloyne and Ross were joined by clergy and representatives of other religious denominations. The Bible readings were read by Senator Buttimer, Denise Gabuzda (Cork Quaker Congregation), and the Reverend Peter Rutherford (Rector of Kinsale). The prayers were read by Jacqui Wilkinson. The Reverend Peter Rutherford. Armistice Day. The Centenary of the End of World War I. 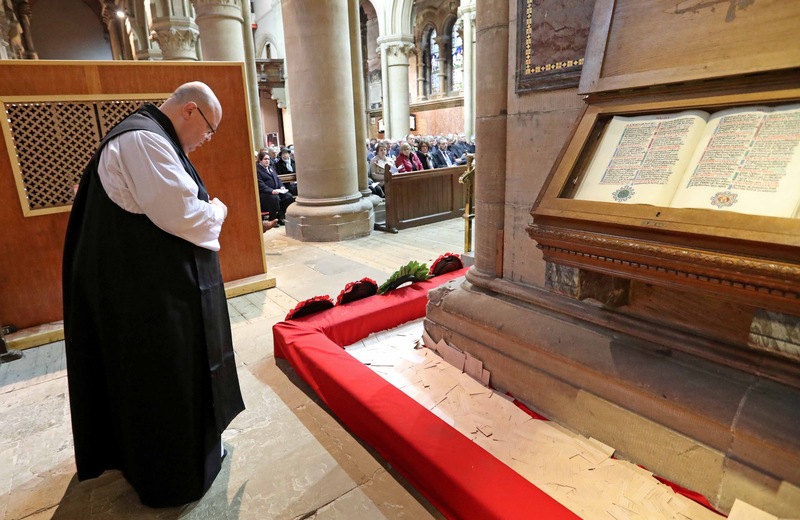 A Diocesan Service to mark the Centenary of Armistice Day, the end of World War I, at Saint Fin Barre’s Cathedral, Cork.Picture: Jim Coughlan. 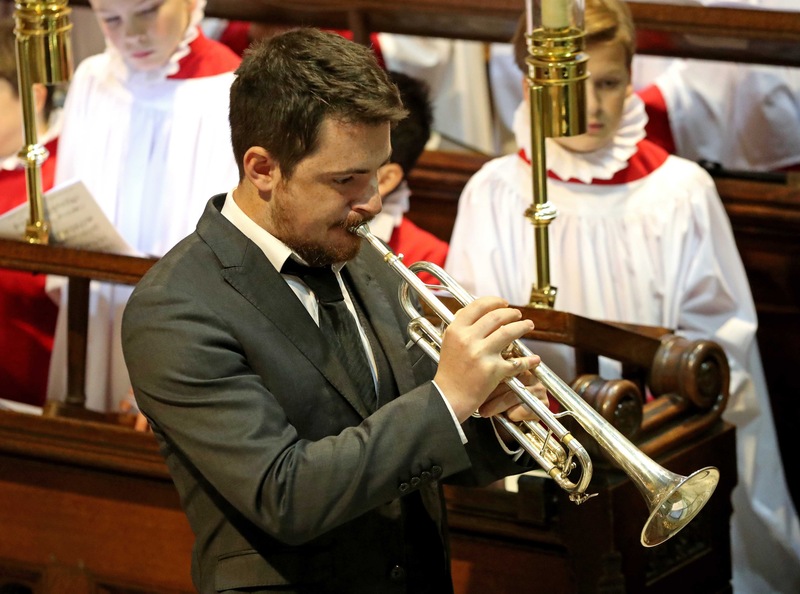 The Dean of Cork, the Very Reverend Nigel Dunne led that Act of Remembrance during which the Last Post and Reveille were played by trumpeter, Michael Mullins. The Dean of Cork, the Very Reverend Nigel Dunne. Armistice Day. The Centenary of the End of World War I. 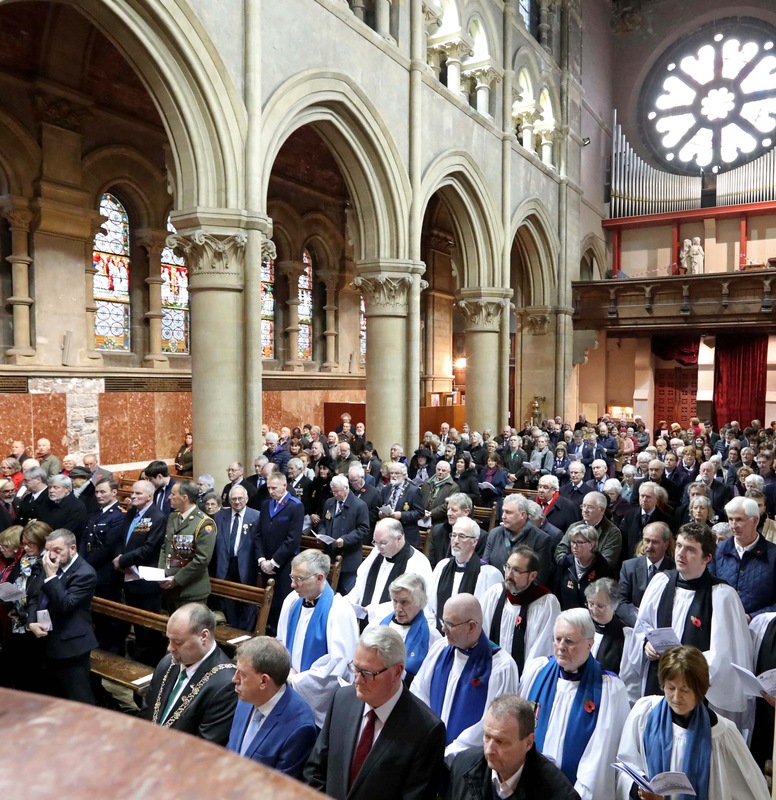 A Diocesan Service to mark the Centenary of Armistice Day, the end of World War I, at Saint Fin Barre’s Cathedral, Cork.Picture: Jim Coughlan. Michael Mullins, playing Reveille, during the Service. The Cathedral Choir, under the direction of Mr Peter Stobart, with Phoebe Tak Man Chow at the organ, sang especially chosen music. The central musical item at the Commemoration was a setting of text from Psalm 90 by Ralph Vaughan Williams (who himself served in the First World War) Lord, thou hast been our refuge. It combined the words of the psalm with passages from the hymn O God, our help in ages past which is traditionally used at times of Remembrance. 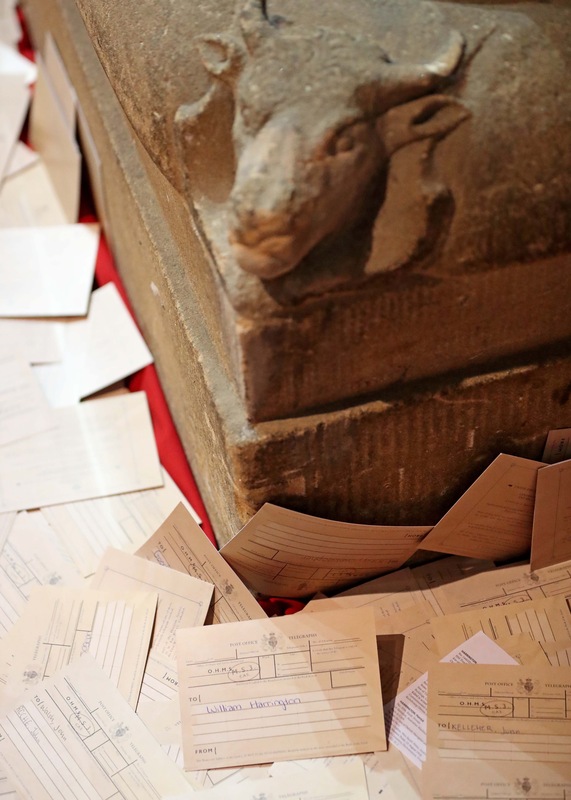 A very moving and poignant moment in the Service was when students from the three schools in the Diocese carried forward the c. 4,200 telegrams the Bishop had asked them to write, in baskets, and poured them at the foot of the Cathedral’s own war memorial. Many spoke afterwards about how moving they found it to hear the telegrams falling to the ground. 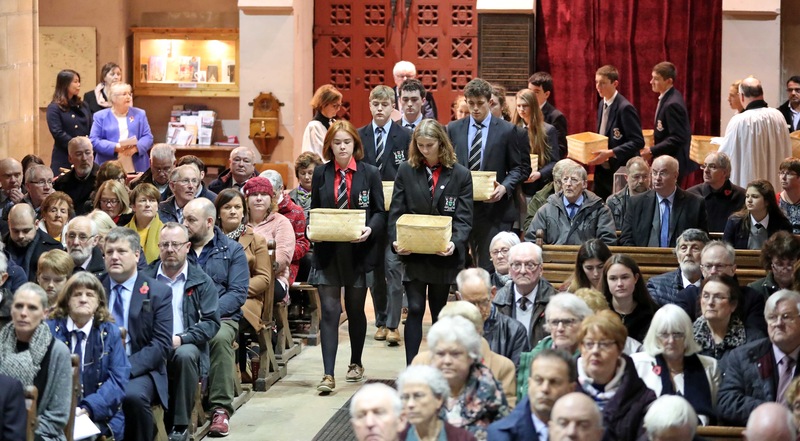 This entry was posted in Bishop, Cathedral, Centenaries in Ireland, Centenary, Community Involvement, Decade of Centenaries, Diocese, Remembrance, Remembrance Sunday, Schools in the Diocese. Bookmark the permalink.